I said goodbye to The Subtle Bus, my bright yellow van which has served me well for the last 8 years and warmly welcomed Bimble into the Bradshaw Adventure family and boy do we have big plans! Plans which will, at times, push me out of my comfort zone, wandering around the country meeting amazing people and taking other amazing people along too, and going to places we have never been and learning new skills. I'm keen to push my limits and learn new skills, to highlight outdoor adventures that you can get involved in and promote just how easy it is to simply get outside. The outdoors is so good for your mental health and as I am fundraising and supporting children's mental health charity Place2Be, mental health is so important to me. I've managed to persuade (not that there was much persuading needed!) the following bunch of amazing adventure makers to agree to my social plan and have many more to contact and schedule in over time. Passionate about performance coaching, ultra-running (preferably up and down mountains), healthy eats and coffee though not necessarily in that order or mutually exclusive. I am a firm advocate of “outdoors is best” and love to accompany my clients on walking and talking coaching sessions or facilitating netwalking events aka networking, walking and taking business conversations outside in the southwest region. You can usually find me hitting up the trails, planning adventures of all sizes or hunting out independent coffee shops. I am an adventurer and global expedition leader by trade. As an avid naturalist, I combine my passions for adventure and effective conservation through independent and collaborative expedition work in the most remote areas of the world. I am a trained PADI Divemaster, Reef Check Trainer, coral reef ecologist, mountain leader, jungle trainer and yoga teacher, with 20 years’ experience working in all manner of terrains, often with my children in tow. I have worked in the palm house at Kew as part of the 'explainers' team and this has given me an insight into the immense wealth of historical specimens and data held there. Fascinated by this era of exploration and collection I have sought to discover more about the women who made their mark in this field. Now, inspired by this and my own immersion in stunning natural habitats, I lead a series of transformative adventures solely for women. Through travel to extreme wilderness locations, in close proximity to wildlife, I have designed expeditions that open up my world of adventure to any woman who wishes to seize the opportunity to step out of their comfort zone, push their own mental and physical boundaries, and in doing so, rediscover themselves and what lies around them. I am a Salomon sponsored ultra-runner and coach and owner of Running Adventures, through which I coach runners of all abilities, hosts guided trail runs, workshops, trail running weekends and more. I have taken on some of the toughest ultra-races in the world, including the Marathon Des Sables, the Wild Elephant Trail in Sri Lanka and the infamous Berghaus Dragon’s Back Race. Before I made running my life I was a charity fundraising manager for Action Medical Research and then latterly Sparks, both amazing charities who cemented my belief that you need to sieve life and just get out and do it! I am a teacher of Bushcraft and Wilderness Living Skills. I can be found baking bread and rustling up tasty meals over a campfire, whittling spoons, foraging for edibles, walking in the woods and soaking up everything nature has to offer. I have served with the Royal Engineers in Belize, spent time living alongside the Maasai in the Rift Valley and learnt from the Bushman of the Kalahari, motorcycled around Europe, built and paddled my canoe along the Thames, and love heading out on adventures. Escaping the corporate world was my best decision ever, with a long career in technology development and consulting, I now love to teach both adults and children, sharing the skills needed to enjoy living life and having fun outdoors! For over 25 years, I have walked & climbed the mountains of England, Wales, Scotland, and throughout Europe. 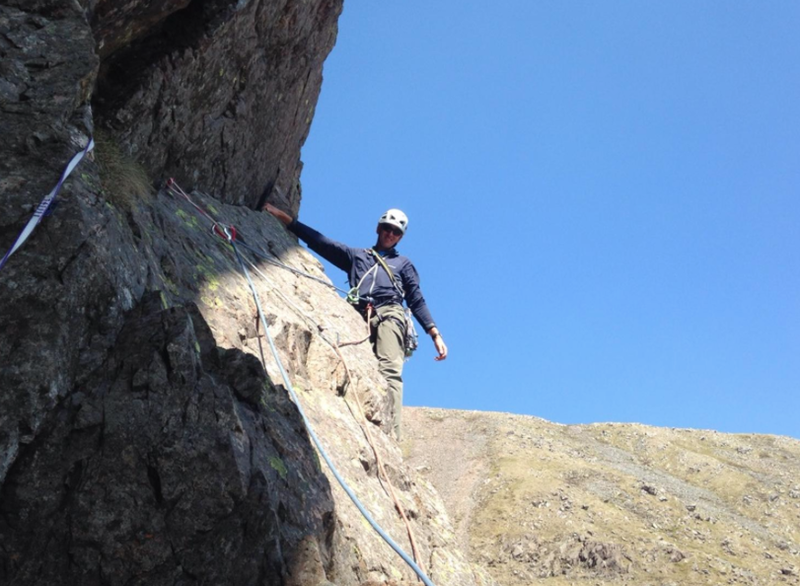 Passionate about the mountain environment, especially the rockier bits, I adore spending time climbing or scrambling. I escaped the rat race of city life in Manchester and moved to the tranquillity of the Lake District 12 years ago and hold a degree in Geography (Open University) with particular interests in Geology & Glaciation and the UK Mountain Leader and Rock Climbing Instructor qualifications. Myself and my partner Kate run Mountain Journeys from our home in the Lake District during the summer and from our Spanish residence during our chillier winters. British adventurer, mountaineer and expedition leader, I am also a Commissioned Officer in the British Army and a survival instructor with the Bear Grylls Survival Academy. I’ve undertaken numerous expeditions across the world, both by land and sea, and travelled to some of the most volatile countries on earth, including Afghanistan, North and South Sudan, Somalia, Libya, Mali and other swathes of Sub-Saharan Africa and the Middle East but my true passion is rooted in the hills and mountains of Great Britain, where I spend much of my time working with young people with the aim of inspiring the next generation to discover their own spirit of adventure. I have spent my entire professional life working in the live events industry, taking me around the world working with incredible artists and creative talents on world class productions. By the end of 2015 I was the founding director of a successful event production company but, with a desire to find and discover more from the world I chose the road less travelled by selling my company, packing my bags and heading out into the unknown. From kayaking through Wales, cycling on the continent, or exploring South East Asia on a dilapidated scooter, I am no stranger to filling my spare time with the new and adventurous. Whilst in New York in the summer of 2015 I took my first strokes on a Stand-Up Paddle Board. 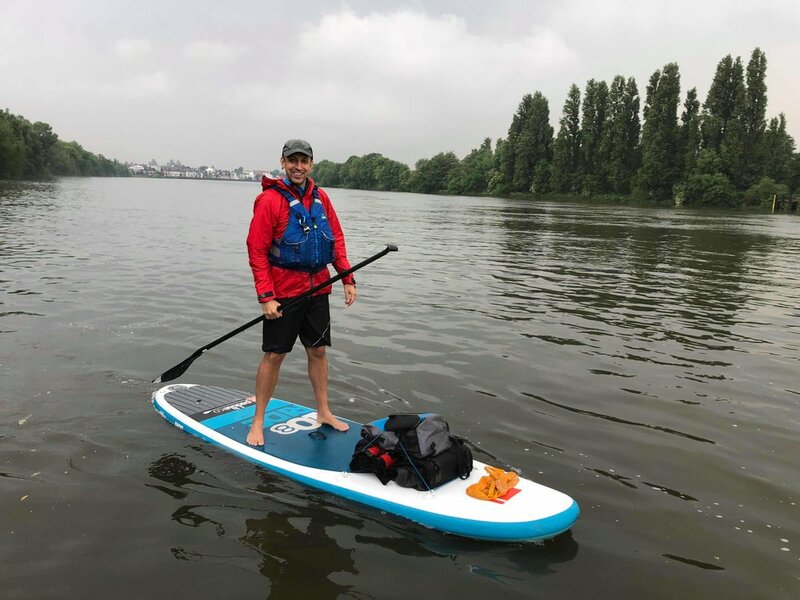 Since then I have become the first person to stand up paddle board the length of the Danube River from its source in Germany to the Black Sea, 3000km later. In 2017 I paddled the length of the Thames over 4.5 days and in 2018 returned to the river once again with a tandem board and team mate completing the same descent in just 59 hours and setting a world record in the process. 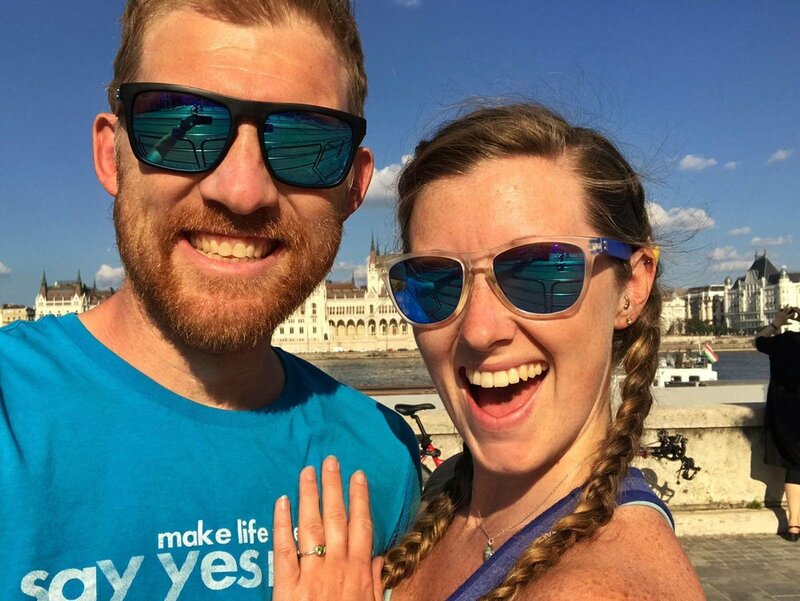 hen not adventuring I work with the Say Yes More organisation helping to nudge people into making their lives more memorable. I regularly give talks of my experiences helping to motivate others to get outside more and most recently have presented at the Duke of Edinburgh's Gold Awards at Buckingham Palace and St James’s Palace. Welcome to the YesBus, part of social enterprise SayYesMore, a countryside basecamp in West Sussex where humans big and small come to heal sizzled minds, learn new skills and hatch fresh ideas. Basically, The YesBus is an incubation chamber for magic. Myself and my humans do all kind of things here, including hosting workshops, skill sessions and co-working days, retreats, outdoorsy weekends and summer camps, all multi-functional with an off-grid power system and high-speed Wi-Fi. I (the bus) am also available to hire for any groups who share our ethos of using community, adventure and optimism to lead positive change. A multifunctional structure with an off-grid power system. My humans would like me to be an example of what you can achieve with space-saving furniture in a relatively small space, and every bit of the bus will at least two purposes. I am a career transformation guide, a trainee bodywork therapist and, more recently, a white-water kayaker. I am passionate about mental health, and I help people to navigate their way through periods of change towards a more fulfilling life. I work for the Blackthorn Trust, a mental health charity which provides specialist therapies and rehabilitation at its unique facilities in Maidstone, which are nestled in a large biodynamic garden, and where nature is one of our therapists! After suffering a dramatic life-changing moment in 2016, I decided to give myself six months to become a white-water kayaker, culminating in an attempt to kayak down parts of the river Durance in the French Alps in July 2018, and raising money for the Blackthorn Trust in the process. In the longer term I intend to link together the coaching, the therapy and the kayaking to help people to find their purpose, release whatever is holding them back, and to use outdoor activities to generate skills, confidence and self-esteem. I am a secondary school deputy headteacher and a teacher of modern foreign languages. I live in Kent with my husband Scott and our dogs. Away from my work in the school I am an International Mountain Leader, instruct on DofE expeditions with our company Adventure Training and Expeditions and support BAIML with their social media presence as well as delivering CPD to fellow IMLs at the AGMs. I enjoy challenging mountains, ultra-adventure racing having recently completed the Yukon Arctic Ultra and the Marathon des Sables and working with clients from all backgrounds keen to fit more adventure into their lives. In my spare time I play the surdo drum in a samba band, I like netball but most often you will see me hauling a tyre preparing for the next arctic race! From wheelchair bound to world class athlete, Beth French stretches the horizons of her own possibilities, tackling seemingly impossible feats of endurance and adventure. Beth suffered with ME from the age of 10 and by 17, she was in a wheelchair. Overcoming debilitation, she forged a path to ultimate health her own way. Beth is the first woman to swim the notorious Kaiwi- Channel of Bones, in Hawaii twice and the first person ever to swim from Cornwall to the Isles of Scilly. Last year, she was named as one of the World Open Water Swimming Association’s top 50 adventurous female swimmers. In 2017, Beth walked away from a world first, record setting, swim series with the end in sight. Find out the many faces of triumph she met as Beth takes us with her into the depths of the night, far out to sea and back to shore. With all her exploring, she still maintains she is ordinary and adventure is in all of us, every day. What is success in adventure, and what does it mean when your destination is no longer the goal? Beth spins a rip-roaring yarn that will leave you inspired and thought provoked, with a strong sense of why you want to tackle your own challenges in the first place.